Boil Potatoes, peal and mash. Heat oil in a pan, add rai, jeera, urad dal and chana dal. When rai starts spluttering add chopped onions and green chillies and fry until the Onions turn pink. Now add haldi and curry leaves stir and add mashed potatoes. Add salt and mix well. Switch off the flame and add lemon juice (optional ) and coriander leaves mix well. Let it cool. Make lemon size balls of the aloo mixture and keep it aside. Now take basen in a bowl. 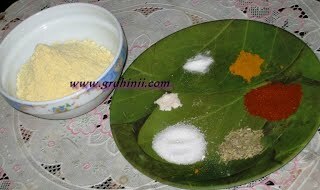 To it add hing, salt, chilli powder, soda bicarb, haldi and fennel seeds. Make a smooth batter adding enough water. Heat sufficient oil for deep fry in a pan. Now dip the aloo balls in the batter and slowly drop them in the Oil. Fry in a medium flame until golden color. 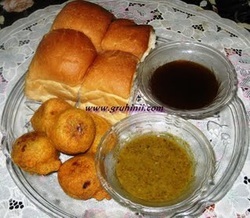 Prepare the rest of the vadas in the same manner. Drain and keep them aside. 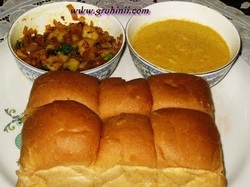 Hara chutney and imli ka chutney. Place the vada in between and serve. 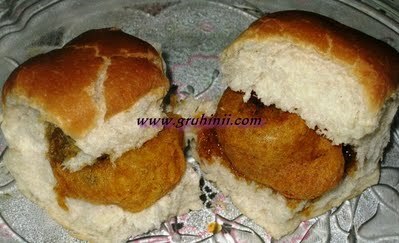 Tasty Vada Pav is ready. Enjoy ! !